exhibition (which closed on April 1), explored the artistic communities who were active in the artist-run Tenth Street galleries of downtown Manhattan and beyond. These unique spaces showed works by iconic postwar artists such as Romare Bearden, Red Grooms, Allan Kaprow, Yayoi Kusama, Claes Oldenburg, and countless others. A companion to the Grey’s exhibition New York Cool of 2008, which looked at downtown’s New York School artists through the lens of the NYU Art Collection, Inventing Downtown sheds light on the foundational networks that supported the artists who created Happenings and other art performances. Within these galleries, artists were free to experiment outside of the commercial, uptown constraints placed on artmaking at the time. These unconventional galleries served as cornerstones of the artistic movements that came to mark the landscape of contemporary art. While every gallery, representing its own set of artists, served as an individual agent within a collaborative network, one gallery in particular, the Tanager Gallery, came to present the works of some of the best-known postwar figurative and realist artists—such as Philip Pearlstein, Myron Stout, and Alex Katz. Founded in 1952 by five young Americans, Charles Cajori, Lois Dodd, Angelo Ippolito, Bill King, and Fred Mitchell, the Tanager was arguably the most influential of the co-op galleries, for it redirected contemporary dialogue away from the previously dominant influence of abstraction—enabling artists such as Alex Katz to exhibit their counter-abstractionist works. After joining the Tanager in 1956, Katz soon became one of its most prominent artists; he had previously exhibited there twice, in 1953. Developing a new approach to American Realism, also known as New Image Painting, Katz made his own niche among his contemporaries. Included in Inventing Downtown was a painting by Katz from the NYU Art Collection that illuminates his struggle between abstraction and figuration. Ada Ada (1959) presents the viewer with a philosophical mediation on the status of portraiture and the notion of the muse. In this work, Katz depicts his wife and favorite subject, Ada Del Moro Katz, twice—offering us a doubled view. 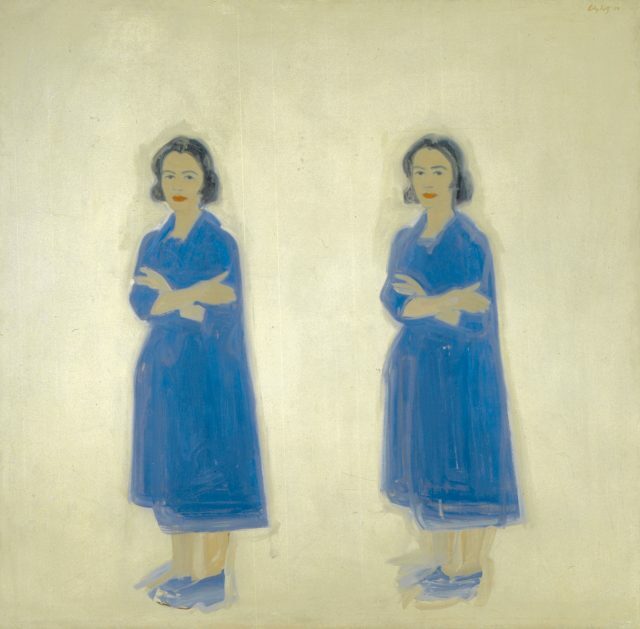 Shown in front of a monochromatic background, the two Adas float in a blank abstract field. Dressed all in blue down to her shoes, Ada crosses her arms and hunches her shoulders, confronting us with a neutral gaze. Although at first glance the two Adas appear identical, upon closer inspection they contain distinct differences in pose, expression, and brushwork, challenging our tendency to see them as mere reflections of one another. In portraying Ada on a monumental scale, Katz elevates figuration, asserting it as coequal to works by the revered Abstract Expressionists of the previous generation. Irving Sandler, Alex Katz (New York: Harry N. Abrams, 1979). Carter Ratcliff et al., Alex Katz (New York: Phaidon, 2005). Robert Storr et al., Alex Katz Paints Ada. Exh.cat. (New York: Jewish Museum, 2006). Melissa Rachleff, Inventing Downtown: Artist-Run Galleries in New York City 1952 – 1965. Exh. cat. (New York: Grey Art Gallery and DelMonico Books, 2017). Daniel Domínguez is an undergraduate intern at the Grey Art Gallery. He is studying at NYU Gallatin, and will graduate in the Spring of 2017.